Call Fred or Cody today! 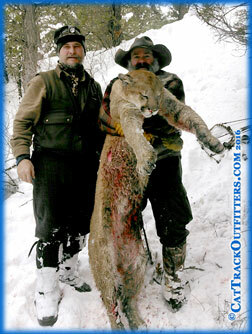 Fred Wallace, owner, is the second generation and has been guiding hunters for over 30 years, and hunting for over 40. His sons, Cody and Ty, also guide and can track like their dad and grandpa, Bill Wallace. Hunters enjoy a 1:2 guide to hunter ratio plus a high probability of seeing and getting in close to the big game that they're hunting. A 50% non-refundable deposit is required to confirm booking. Final payment is due andpayable before the hunt starts and may be paid by cash or a money order. 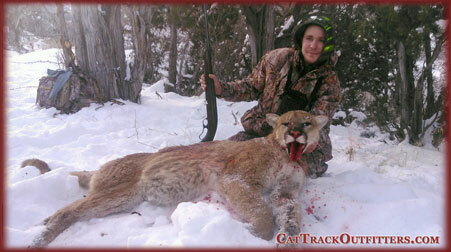 Upon booking, we will furnish you with a contract stating everything that we do for you and expect from you as a hunter. We do not allow excessive drinking in the camp and there is no drinking (of alcoholic beverages) in the field at all. 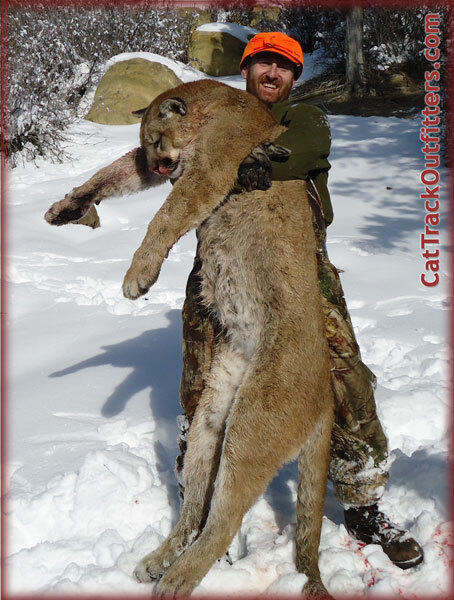 This is Nate Miller from Indiana with a nice Tom lion taken Dec. 2015. 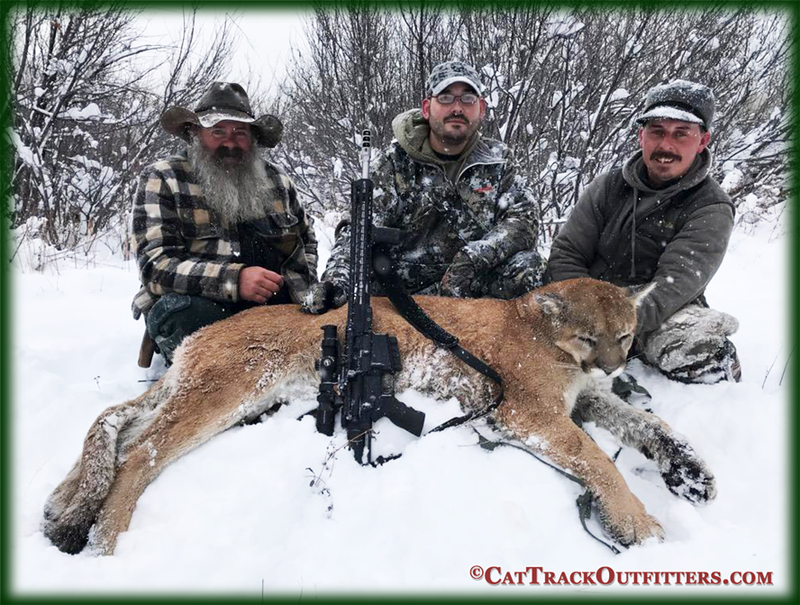 Cat Track Outfitters, located in Collbran Colorado (about 40 miles East of Grand Junction CO in Mesa County and 50 miles from the Utah border), has guided and outfitted hunters from Jonesborough TN, Frankton CO, Appleton WI, Denver CO, Palisade CO, Finleyville PA, Fort Scott KS, Chicora PA, Greenfield IN, St. Cloud MN, Moore TX, LaGrange GA, Broomfield CO, Akron NY, Waymart PA, Lake Ariel PA, Coushatta LA, and many other towns in AR, AZ, CA, CO, FL, GA, IL, IN, KS, KY, LA, MA, MD, MI, MN, MO, MS, MT, NC, ND, NE, NJ, NV, NY, OH, OK, OR, PA, TX, UT, WA, WI, WY. Seeing and getting in close to the big game when you take a guided deer hunt or a guided mountain lion hunt is a delight almost all hunters enjoy with Cat Track Outfitters. 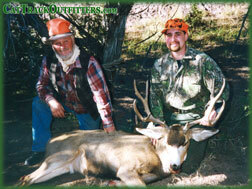 Experienced, professional hunting guides and outfitters will take you on an unforgettable Colorado hunting trip.